Thanksgiving is just around the corner! I’m not hosting Thanksgiving Dinner, my sister Debra has that honor. But I’m helping plan. And I love it! Imagine that, me loving a party! Innocent enough right? I was touched and a little excited. I loved the idea of all the girls dressing alike! Hummm, did I mention that my mom was a bit of a sneak? The following, are the pictures of us on Thanksgiving Day…. I believe my expression says the rest. 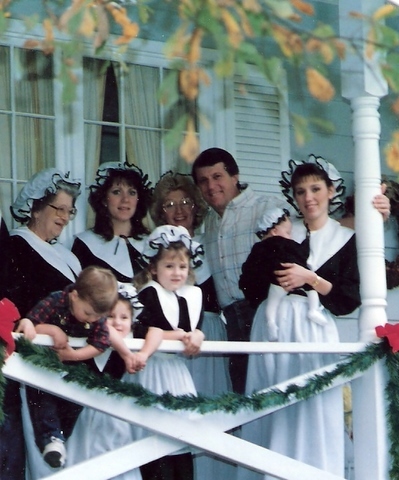 Oh my little girls are dolls, even dressed up like stupid Pilgrims. 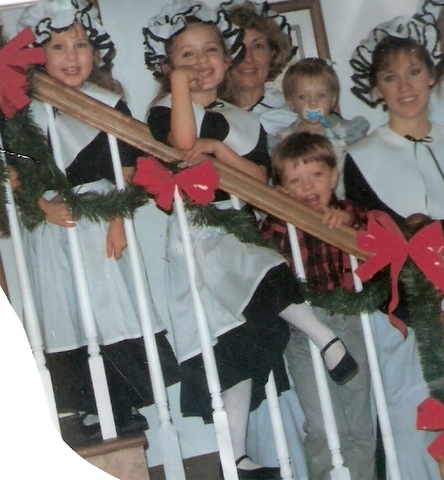 Look at our tiny Pilgrim, my niece Jamie Brooke! And the little boys got to wear osh-kosh…no fair! I believe we did this for 2 or 3 years before someone, probably me or Bethany,(even as a little girl she took charge!) put their foot down…and just said NO! I promise that some of the other things we did and still do, on Thanksgiving will be much more fun and much less humiliating! « Priceline…kinda like buying crack in church! That is a total riot! I keep scrolling back through because that is just CLASSIC! And you all so nicely played along. I don’t think any thanksgiving story I could come up with would even be remotely as hysterical as that! Oh, thank you for sharing that! OH MY GOODNESS! I am SO linking to this post. Please do tell your other Thanksgiving traditions. This was incredibly fun. 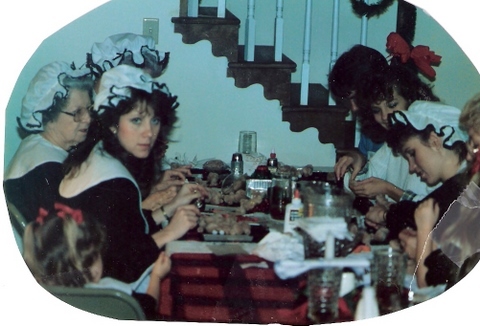 I can’t believe you guys sat around the table and ate in costumes. Did you have to finish up the cooking in them, too? Vicky, I’m so glad you got a grin! Anita, girl, we did EVERYTHING, ALL DAY in these outfits! I will say that the 1 hour drive to my mom’s house was the worst thing. Several people on the freeway pointed and laughed. Mike would drive right next to a car so they would look over at us…I know I’m going to end up paying for Bethany or Stephanie to have therapy over this. See what I mean, Rob? There are people like me who don’t know how to do this kind of stuff. I always wanted to be one of your children at Thanksgiving (or Easter, or Christmas, or Halloween, or St. Patrick’s Day). Ohhhh, and especially on Valentine’s Day. Aaaaahhhh!!!! I had mentally blocked this from my mind!!! Too funny-im glad you posted those pictures! Love you! I am suddenly so INTENSELY grateful that my mom has no idea how to sew. She always said if there weren’t people like us in the world, people who sew for a living would have no one to sell their stuff to. I’m also grateful she didn’t run into anyone selling pilgrim outfits. You are such a good sport!!! Ok, that has to be taking Thanksgiving a little tooooooo far! I love it! How fun and hilarious!!!!!!!!! 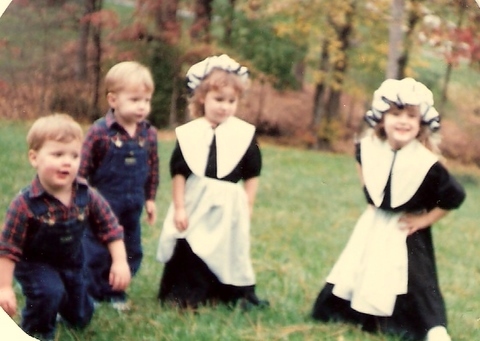 I have to ask…do you still own those outfits? Wow. I’m not sure whether the outfit or my chubbiness is more ridiculous. I just framed a pilgrim picture yesterday and I must say that your expression, which can only be described as one of disgust, is exactly the same in every picture. My favorite thing, however, is seeing Gramma in her costume. Could anything be more huggable? I can’t wait for the decoupage pictures! Imagine my surprise when I was directed to this sight from another one. As I was reading about your Thanksgiving I couldn’t help but wonder how many people with the name of Robin had daughters named Bethany and Stephanie and a son named Timothy?! And later Emily. I scrolled through the pictures and knew it was you! How are you? Once or twice a year I chat with Ruth (we are living in Germany at the moment) and she keeps me informed about you all. I am jealous you have a grandbaby on the way. One of our sons will finally marry this summer so I have a ways to go. Tell Mike hi for us. Your girls were adorable! I am embarrassed for you, but love you just the same. You are a humble woman, lol. I cannot help it, your family cracks me up. Are you doing a craft this Thanksgiving? The truth is I am just jealous! My family are all nerds who don’t do stuff like you all. I love experiencing it through your family. It is quite a treat. very perceptive. Betty would be honored. Thank you. I got in to bed tonight at 11:15 and my eyes popped open and thought, Oh my goodness, I hope Rob does not think I mean embarrassed because you all did something wrong. I was thinking of the mop hats when I wrote that. 🙂 I hopped up and came back downstairs to write this note. My favorite thing about your family is how you make every event memorable and special. Your mom had a special gift of helping those around her to feel special by all the thought she put into each event, you have followed in her footsteps beautifully. So much thought goes in to each event to make it a memory for all. These pictures are adorable. I know your children love the memories your Mom and Family created for Thanksgiving. It is tough to top an ORIGINAL, and I believe that ‘s what your Mom was. The preparation that goes into a holiday gathering such as this is mind boggling, yet your Mom did it with LOVE as the main reason. The traditions your family enjoys are priceless. Take every moment God gives you, to reflect on the special times when All the Family could laugh and enjoy being together. Remember, we may never pass this way again.